Minamishinshu Beer Company is fast becoming one of our favourite breweries in Japan and Minamishinshu Golden Ale is one of their flagship beers. It’s a 5% golden / blond ale from the depths of Nagano and is brewed using fresh snow water from the Northern Alps. Not those alps in Europe but the alps that extend through Nagano up to Niigata. 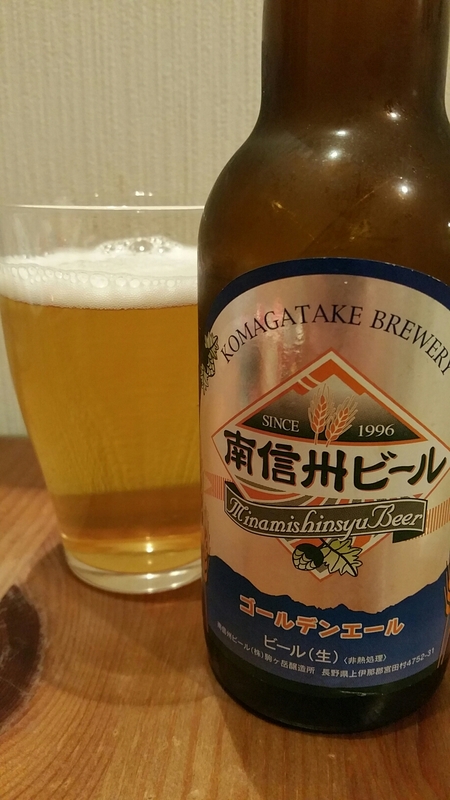 Besides that, Minamishinshu Golden Ale has also won two awards Japan beer competitions, gold in 2000 and silver in 2003 and also Asia’s Best Golden Pale Beer in 2013 at the World Beer Awards. Minamishinshu Golden Ale didn’t have the most auspicious of starts as all the information we could find out about it was conflicting. First it’s a 4% beer, then next it’s a 5% beer. Then it’s a golden ale, followed by a blond ale, then a kölsch beer. Crikey, in the end I just went with the information on the bottle and from the brewery. I went with a 5% golden ale, and I’m sticking with it. Why there can’t be simple, straightforward information about beers on the internet? It poured out a light golden colour with a minimal amount of thin white head that dissipated very quickly to a ring around the edge of the glass. There was a fresh aroma of malts that reminded me of Kellogg’s cornflakes, an interesting aroma there. There was also some citrus aroma going on but pretty weak compared to the cornflake-like aroma. I couldn’t stop thinking of my breakfast throughout drinking it and felt like I should have a coffee on the go as well. The crisp bite of the hops was the first thing that got me upon drinking, with the cornflake aroma, thankfully, not presenting itself, as that would just have been weird. Those weary about bitterness from hops needn’t worry as the hops in Minamishinshu Golden Ale didn’t produce much of a bitterness. It had a crisp, refreshing aftertaste that satiated my thirst until the next drop. The citrus flavour is present so if you’re looking for a beer that presents hops well, you’re in luck with Minamishinshu Golden Ale. Minamishinshu Golden Ale can be bought from the Minamishinshu Beer Company on here. It can also be bought from Sakaya Okadaya here, from Crafbeers.jp here, or as part of a set from GoodBeer here. We’ve also seen it in Nomono in Akihabara and also Le Collier in Tokyo station.